Thermal imaging has evolved into one of the most valuable tools for preventative maintenance by detecting anomalies, quite often invisible to the naked eye. 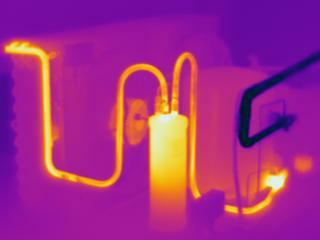 Thermography allows corrective action to be taken before costly system failures or shut-downs occur. Numerous industries world wide have discovered the advantage of including infrared inspections in their preventative maintenance program. City Line Ir will work with your preventative maintenance team to do inspections and provide equipment trending reports, so you can take any maintenance steps needed before units break down while operating. A major plus for Infrared/thermal imaging inspections is the ability to analyse historic trending of given equipment for potential problems. Temperatures recorded now can be compared to those from the past, giving a pattern of either wear and tear or changes in loads.